The 2018 Davis Meet Weekend date has been set! The Davis Meet Weekend website has been updated with 2018 event information! Please note that event details are still being coordinated and confirmed. When details are released, announcements will be posted to the websites, mailing list, and social media pages. If you are able to contribute and/or interested in joining the team (or know anyone that is), please let us know! Interested in supporting the 2018 Davis Meet Weekend? Interested in volunteering at the 2018 Davis Meet Weekend? Last edited by volvie! ; 03-22-2018 at 10:01 PM. A couple 2018 Davis Meet Weekend updates! T-Shirt Pre-Sales are now open! A 2018 Davis Meet Weekend update! A 13" x 19" poster is included with each registration! A limited number of additional copies will be available at the Sunday event for $5 each while they last. There is one week left to pre-order an event T-shirt! Interested in contributing to the 19th Annual Davis Meet Weekend as a Volunteer? Looking forward to seeing you at the 19th Annual Davis Meet Weekend! Hope you are well and looking forward to the official start of the 2018 Davis Meet Weekend! We're now a couple days away! 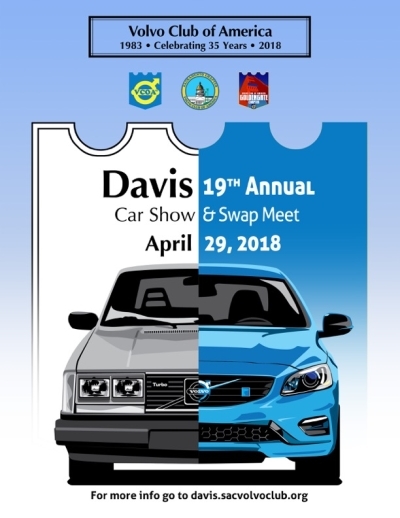 If you have not yet Pre-Registered, a friendly reminder that the 19th Annual Davis Meet Weekend Pre-Registration closes tonight (April 25th) at midnight! This year's show is shaping up to be one of the biggest yet! As the show grows, so does the need for volunteers! We especially need volunteers to help with front gate check-in, parking, and registration operations on Sunday morning from 6:50 a.m. until 9:00 a.m.
Plan on bringing your camera to 2018 Davis Meet Weekend and interested in sharing your photos? Looking forward to seeing you all on April 28th and 29th! Last edited by volvie! ; 04-25-2018 at 05:06 PM. Hope you are well and enjoy your travels to the 19th Annual Davis Meet Weekend! 2018 Davis Meet Weekend Updates, & Reminders! The event maps have been finalized and added as PDFs for ease of reference on the day of the event! More Volunteers are needed on Sunday morning to help with front gate check-in, parking, and registration operations on Sunday morning from 6:50 a.m. until 9:00 a.m. Thank you to all volunteers-- your time and contributions are appreciated and make this event possible! Please bring your show registration, swap meet space, and/or t-shirt pre-order receipt(s) with you to the show! 4. T-shirt orders will be available for pickup at the registration table from 9 a.m. until the close of the show. Please bring your payment receipt with you. A few t-shirts will be for sale in a limited range of sizes. Hope you are well, had a safe drive home, and had a great night's rest! We had a great time and look forward to seeing you all at the 2019 Davis Meet Weekend Events! Stay tuned for more updates as we finalize the car counts, confirm volunteer lists, compile the awards list information, go through our photos, and submit an article to Rolling Magazine! If you would like to submit photos to Rolling Magazine for publication consideration, please contact us before sharing your photos online. Have feedback, ideas, or suggestions for the 2019 Davis Meet Weekend Events? Interested in joining the team and contributing to the Event's success?